Featuring a sleek and delicate stainless steel case with matte finishing, the Path smartwatch discreetly conceals its tech behind a watch face that is modern, chic and traditional, and is the brand’s most fashion-forward hybrid thus far. 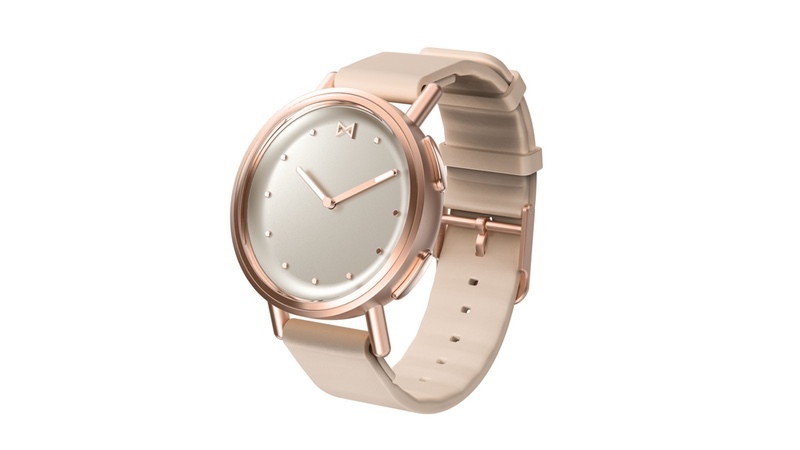 Available with gold tone details and silicon sport straps in fresh, soft colours, Path also boasts the interchangeable strap functionality, which allows for ‘endless style possibilities with a wide range of 16mm strap options’. Like its hybrid predecessors, Path automatically tracks steps, calories burned, distances travelled, and sleep duration and quality via a 3-axis accelerometer. Users can also create and receive customized call, text, email, and app notifications, so they can stay connected without ever having to look at a screen. Path users can also leverage auto-update time and date functionality, set a second time zone, and create vibration alarms and movement reminders. Path also features a smart button that acts like a remote control and lets users play music, take a picture, connect to other smart devices, and ring their phone. Like Misfit’s other hybrid smartwatches, Path is swimproof and water resistant up to 50m, is non-charging and features a replaceable battery that lasts up to 6 months. Misfit Path is available in four colorways: Stainless Steel, Rose Tone, Gold Tone, and Stainless Steel with Gold Tone Accent. Path starts at US$149.99 and is available now on misfit.com. Other ‘design-forward wearables’ in the company’s portfolio include Vapor, Command, Phase, Ray, Shine 2 and Flare.